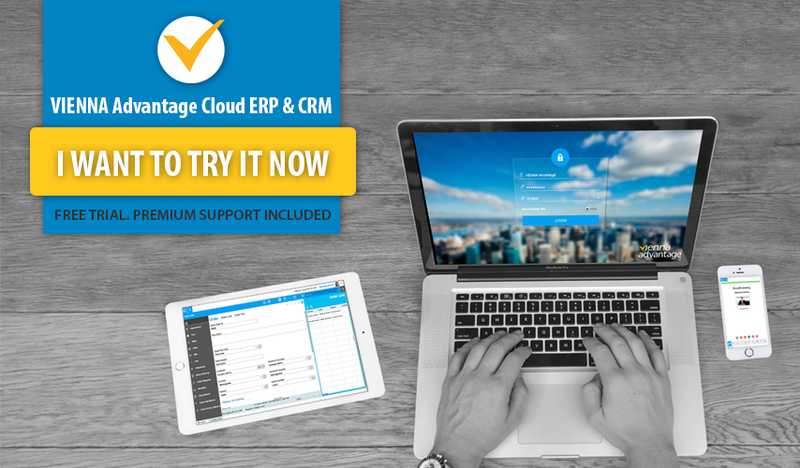 VIENNA Advantage > Technologies > What is the difference between ERP and MRP? Today, ERP and MRP (Enterprise resource planning and material requirement planning) are seen as two complementary systems, where ERP is a backbone that supports multiple modules including MRP. But this was not always the case. MRP was developed in the 1970s as a mechanism for manufacturing companies to calculate more precisely what materials they required, at what time and in what optimum quantities. With the growth of the manufacturing businesses and the complexity of the operations, businesses needed better solution that will help them handle the manufacturing operations. 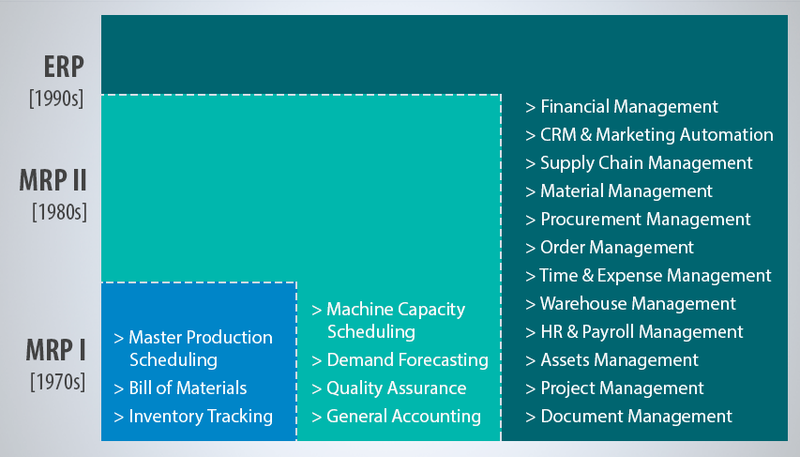 In 1980s, material requirements planning (MRP) evolved into manufacturing resource planning (MRP II) because manufacturers realized the need for the system to reach broader aspects within the company, such as: invoicing, payroll, detailed capacity planning, scheduling and shop floor control. In 1990s, Gartner coined the term ERP and described it as a newer suite of software that would encapsulate all the processes contained within MRP II software while also integrating applications for other operations such as Financial Management, HR & Payroll management, Customer Relationship Management and other. That is how the ERP system was born. So we are right to say that MRP evolved into ERP. It’s important to note that ERP didn’t replace MRP. The biggest difference between ERP and MRP systems today is that you can buy MRP system as a standalone application. 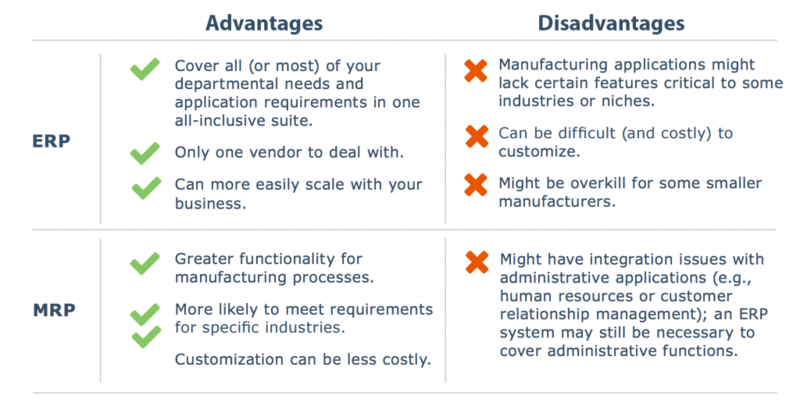 This is common practice among smaller manufacturers that cannot justify a fully integrated ERP system. As mentioned before, MRP (Material Requirement Planning) is software solution that helps manufacturing companies calculate more precisely what materials they require, at what time and in what optimum quantities. MRP II is a more recent version of MRP and includes detailed capacity planning, scheduling, shop floor control and other calculations. MRP II gives companies the ability to compare forecasts with actual data and analyze performance and improve processes to achieve better efficiency. Enterprise resource planning (ERP) is a category of business-management software – typically a suite of integrated applications—that an organization can use to collect, store, manage and interpret data from various departments of the organization. ERP solution integrates the key areas of the business like purchases, sales, manufacturing, human resources, services, inventory, etc., and improves the business processes and flow of information across the organization. When ERP software is implemented in the organization, all the departments can access updated and shared information. In addition to this, the entity is also able to analyze the profitability, performance, and liquidity at any point in time. ERP is a full-business software. It automates and integrates all the systems across an organization that make core business processes run smoothly. It covers all aspects of customer relationship management (CRM) from ordering through payments, including the financial side of the business that the customer never sees. It’s responsible for scheduling operations, keeping inventory records and financial data. In addition, ERPs also assist in defining business processes and ensuring they are complied with throughout the supply chain. MRP is more specific software. With MRP, you don’t have access to financial functions or CRM functions. You do, however, have more control over the manufacturing process without having to attempt the kind of full-scale integration that’s required with ERP programs and applications. MRP may be a single module of ERP. Most ERP applications have built in MRP capabilities that include materials management, shop floor management, bills of materials, quoting, and work orders. The question is, does your organization need all these capabilities? In some cases, the answer is no. And that is why some companies choose MRP rather than ERP. Which system is right for your business? Generally speaking, more niche manufacturers will need a more advanced MRP system or tailored ERP solution to supplement their existing software, whereas smaller manufacturers can often be served by either a lighter MRP system or an ERP system that can handle their manufacturing needs.